How to Say Take Care of Yourself in Nepali Language: – Nepal is a beautiful country with amazing culture and linguistics tones. To be honest, if you want to learn the basics of the Nepali language. It is not difficult but, of course, you will be needing lots of practice and patience. If you are planning to come to Nepal in any events or future conditions that you are coming to our beautiful country from any nation or any corner of the world and are not somewhat familiar with the language here, you will experience serious difficulties and may have problems on daily basis or might get someone offended. Yes, this will because you trouble or will get you stressed out but do not worry because we can fix that.You need to take in some helpful expressions in Nepali on the off chance that you will be in Nepal. Obviously, you can have an interpreter close by consistently, yet that may be costly or not all that acquired constantly. Nevertheless, it is always good to learn another language, just because you can experience culture and linguistics tone as a whole. And yes, there is quite a lot chance that you will be visiting Nepal because once is never enough. You will have various thoughts in your mind but do not worry because we are here to help you get through these problems. Leave in some feedback if you wish to. This statement is an informal and highly used while speaking Nepali. This statement literally means ‘take care’. The statement is used at almost any time by the speaker when trying to show genuine care for the audience. The statement is used mostly to among the people of equal age or with a friendly relation or with people on equal status to show love, affection or appreciation. It is socially liked the way of speech. You can use it anywhere. This is more formal than the previous statement and can be used while writing too. This statement in literal English means you take care. This statement is used by the speaker when the audience is a singular person and is equal to him/her in terms of age, social or occupational status. This statement delivers the sense of love and affection as the previous one. It will show how much love and respect a person can carry and deliver to people around them. So you might also be getting such phrases as well. This statement “Timi Haru khyal Rakha” is exactly as the previous one. However, this statement is used by the speaker when an audience is a group of people who are equal to him/her in terms of age, social or occupational status etc. This is also a highly formal way of saying take care in Nepali. This statement in literal English means ‘you take care of yourself’.The word ‘Afno’ in the statement means yours. It thus means take care of yourself. This although sounds to be a little rude it is a polite way of speaking and the emotion can be reflected in the way speech is made. To clarify more, it also can be meant as please take care of yourself or rudely take care of yourself. This statement is also to be used for the audience of speaker’s age, status, or to show juniors affection. This statement in literal English means you take care. This statement is used by the speaker when the audience is a singular person and is senior to the speaker. This delivers a sense of respect as well as emotional desire to see the senior in proper health. This statement is also used to the audience of equal status or age to show a sense of respect and care. You can use this phrases generally and the meaning won’t alter if you are telling it to the people who are younger than you. This statement “Timi Haru khyal Rakha” is exactly as the previous one. However, this statement is used by the speaker when an audience is a group of people who are senior to the speaker in terms of age, work, occupation or job status or social level. This statement is also highly formal ways of saying take care in Nepali. This statement in literal English means ‘you take care of yourself’. This statement is used by the speaker when the audience is a singular person and is senior to the speaker in terms of age, work, occupation or job status or social level. The word ‘Afno’ in the statement means yours. It thus means take care of yourself. It is very polite form in Nepali although its English translation can be found to be used very rudely. 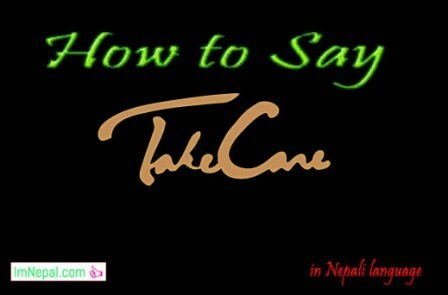 This is an informal way of saying ‘take care’ in Nepali. This statement is used when the speaker is addressing the person who is very close or friendly, the friendship here needs to be indifferent towards slight lack of respect for this statement to be used. This is because although the statement shows lots of care the attitude is little or less friendly. This same statement is also used as a threat to somebody to say it like watch your back. You will be hearing this a lot from the surrounding because it is used very much in most part of the country. The literal translation of this statement to English is ‘take care of your health’. The statement here conveys the information to take care only of the health. This statement is generally used with senior people than the speaker and to the people who are sick or are in hospitals. This statement is also the claim of love and affection towards the audience from the speaker. The literal translation of this statement to English is also ‘take care of your health’ however; this statement is used with people of commonage and with friendlier attitude. This phrase is used to show affection and love among friends. The statement here conveys the information to take care only of the health. This statement is generally used with people equal to the speaker and that are sick or are in hospitals. The literal translation of this statement to English is also ‘take care of your work’ however; this statement is used with people of commonage and with friendlier attitude. This phrase is used to show care for the work of the friend and to make them conscious of their responsibilities. This statement is generally used with people equal to the speaker. However, the statement can be friendly or offensive in terms of the emotion behind the speaker’s intention and way of speech. The literal translation of this statement to English is ‘take care of your work’. The statement here conveys the information to take care only on the work. This statement is generally used with senior people than the speaker. This statement is also claimed to ask the speaker to perform a certain work. Although it is taken fairly formal in the job or occupational surroundings using this phrase in formal or social life is avoided as it is considered rude to claim command over seniors. This statement is informal and highly used while speaking Nepali, however, it is not used while writing. This statement literally means ‘be careful’. The statement is used at almost any time by the speaker when trying to show genuine care for the audience. The statement is used mostly to among the people of equal age or with a friendly relation or with people on equal status to show love, affection or appreciation. This can also be regarded as a form of suggestion to people from their friends or elders. Although similar to previous one this is more formal than the previous statement and can be used while writing too. This statement in literal English means you are careful. This statement is used by the speaker when the audience is a singular person and is equal to him/her in terms of age, social or occupational status. This statement is exactly as the previous one. However, this statement is used by the speaker when an audience is a group of people who are equal to him/her in terms of age, social or occupational status etc. This statement in literal English also means you are careful. This statement is used by the speaker when the audience is a singular person and is senior to the speaker. The difference is shown by the use of the word Hajur and –unu hos at the end. This is used to show respect. Thus, this delivers a sense of respect as well as emotional desire to see the senior being careful. This statement is also used to an audience of equal status or age to show a sense of respect and care. This statement is exactly as the previous one. However, this statement is used by the speaker when an audience is a group of people who are senior to the speaker in terms of age, work, occupation or job status or social level. This is an informal way of saying ‘be careful’ in Nepali. This statement is used when the speaker is addressing to a person who is very close or friendly and who shows indifference towards showing mutual respect. This is because although the statement shows lots of care the attitude is little or less friendly. This same statement is also used as a threat to somebody to say it like watch your back. This statement in literal English is ‘be cautious’. This statement is used when the speaker is addressing a person who is equal to him/her. This statement is also used when the situation is likely to be more dangerous and more likely to for the audience to get hurt. This form is not used in writing but only while speaking Nepali. This statement is the formal way of writing and speaking the previous statement. These both statements show same intent and same emotion. The difference is that this statement can be used in written format and is less preferred while speaking. This statement in literal English also means you are careful. This statement is used by the speaker when the audience is a singular person and is senior to the speaker. This statement is also used when the situation is likely to be more dangerous and more likely to for the audience to get hurt. This is an informal way of saying ‘be cautious’ in Nepali. This statement is used when the speaker is addressing to a person who is very close or friendly and who shows indifference towards showing mutual respect. This statement shows also intent on possible danger and possible bad outcomes. This statement is used when the likeliness of getting hurt or being in danger is very high. This same statement is also used as a threat to somebody to say it like watch your back and express grave anger towards the audience. So here we have some expressions that you can tell in Nepali and it is always fun. The expressions given above is for saying “take care” in Nepali. If you are busy and caught up with your tours and jobs and we have no time to learn anything except these, this page can be quite a help for you. If you have any phrases that you want to learn and cannot get access from, then do not forget us since we are here to help you. Do not forget to write to us in our comment section and if you have any suggestions or expression that you have hard time learning, then feel free to tell us. Please go to our page and like and share if possible.